Four new Irish record fish were caught by anglers during 2018 according to the just-published Irish Specimen Fish Committee report. New records were set for four marine species – Golden Grey Mullet, Thin Lipped Mullet, Black Bream and Tope. The mullet species were taken in Cork while the Tope was caught off Greystones, Co. Wicklow. Kilmore in Co. Wexford was the venue for the Black Bream. Details of these record fish are in the Irish Specimen Fish Committee Report 2018, which has just been released. The Irish Specimen Fish Committee, which is supported by Inland Fisheries Ireland, is an independent all-Ireland voluntary body which verifies and records the capture of large fish caught on rod by anglers in freshwater and marine waters. 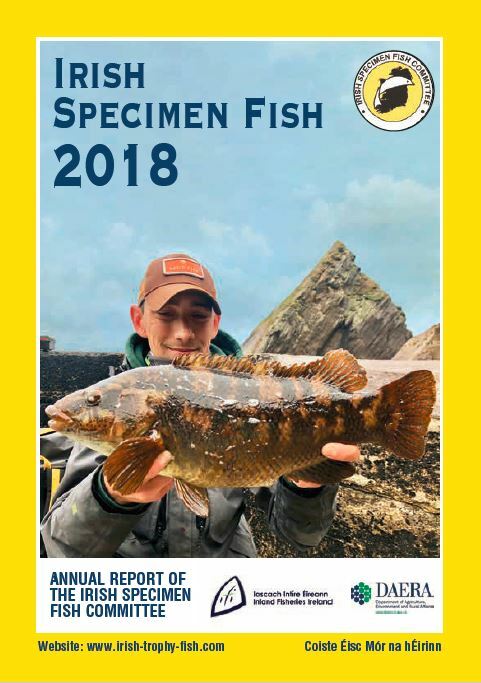 As well as the new record, detailed information on 393 specimen fish (large fish) taken by anglers from venues throughout Ireland in 2018, comprising many different species, is detailed in the report. The main species were smaller shark species like Smooth hound and Spurdog and, in freshwater, Carp and Pike dominated. All fish were caught, weighed, measured and released. The Irish Specimen Fish Committee report is available on the ISFC websitewww.irish-trophy-fish.com or from the Inland Fisheries Ireland website http://www.fisheriesireland.ie/. Hard copies of the report are available from Inland Fisheries Ireland offices nationally. The ISFC Awards Day, when anglers will be presented with their awards and certificates, will be held on 16th Feb 2019 in Dublin (in conjunction with Irish Angling Show weekend: http://www.maramedia.ie/irish-angling-expo). Meanwhile, anglers both at home and abroad will be reading the report carefully to plan their angling trips to catch the big fish in Ireland in 2019. Issued by Irish Specimen Fish Committee, Inland Fisheries Ireland, 3044 Lake Drive, Citywest Business Campus, Dublin 24, D24 Y265. Founded in 1955, the Irish Specimen Fish Committee, is an independent voluntary body, representative of angling interests in Ireland, whose principal function is to verify, record and publicise the capture of large (i.e. specimen) fish caught on rod and line by anglers in Ireland, both in freshwater and marine waters. The Committee also ratifies Irish record rod caught fish. The ISFC coordinates and administers the unique specimen awards scheme which is designed to recognize any angler who catches a specimen fish and to publicise the angling venue. Successful anglers are awarded a certificate and a commemorative badge. Specially commissioned silver medals are presented to captors of record fish and special awards are also made to captors of multiple specimen fish (on a cumulative basis). This report is a detailed listing of all particulars relating to specimen and record fish captures in Irish waters in 2018. Over 29,000 claims have been received by the ISFC over the past 63 years. This dataset is one of the most valuable and long-running time-series of its type. The service is free, and anglers catching a specimen or record fish can check the ISFC website for details on how to claim their specimen. ISFC is funded primarily by Inland Fisheries Ireland, some angling federations, individual anglers and its activities are also supported by representatives from the various agencies that serve on the Committee. Dr. Robert Rosell (AFBI), Chairman, Dr. William Roche, Secretary, Shane O’Reilly and Micheál Hennessy (Inland Fisheries Ireland), Alan McGurdy, Stewart McGrane (Game Angling), Dr. Edward Fahy, Dr. Patrick Boylan (Loughs Agency), Der Casey (Coarse Angling) and Brian Cooke (Sea Angling).